Wearing a helmet is the law when riding a bicycle in BC. Helmets help protect your head against impact. Like the crumple zone of a car, the foam in a helmet crushes to absorb energy. Helmets must be replaced after a major impact. Fit it. Buy the right size, and adjust it properly. The helmet should be snug so that it does not move around. Check the back for an adjustable wheel or strap. Try on a few different helmets and sizes to understand which fits you best. The strap should be adjusted so that you can only fit two fingers under your chin. This helps keep the helmet in place. 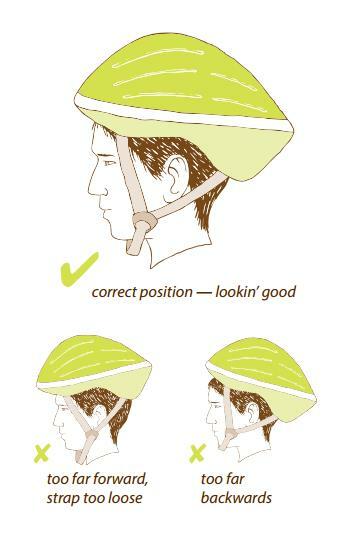 Make sure the helmet sits level to the ground, not tipped forward or back. Find the safety certification sticker inside: it can be from CSA, EN, ASTM, CPSC or Snell B90/B95. Replace the helmet after 3-6 years or after any major hit.